Right from minutes after Apple’s new iPad announcement event ended I’ve been receiving emails from iPad case and accessory manufacturers, touting their products for the new iPad. I’ve also been trying to keep up (a little) with the huge number of cases screen protectors that should be ready to work with the new iPad on launch day or very soon after. 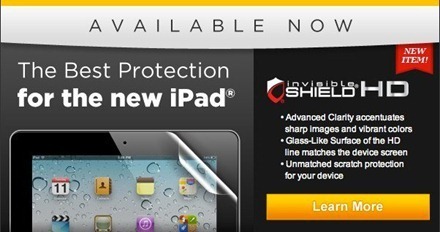 ZAGG invisibleSHIELD screen protector coverage for just the screen or full body coverage. Case-mate – Barely There case for the new iPad, a back cover case that works as a companion to the Apple Smart Cover. Gumdrop – rugged Drop Tech series and two other cases compatible with the new iPad. Waterfield Designs – Muzetto Outback waxed canvas bag for the new iPad. DODOcase Classic for the new iPad – a popular and design-award-winning case, comes in a range of colors. Portenzo – Wingtip for iPad, with the styling of a wingtip book. Cases.com list of premium leather iPad 2 cases that will fit the new iPad, from manufacturers like Beyza cases, Marware, Sena Cases, iFrogz, Vaja and more. iPadaccessories.com has another list, of new iPad compatible cases available on Amazon. My current plan is to stick with an Apple Smart Cover, a Ghost Armor screen protector for the display, and a Gelaskin for the back of the new iPad. I’ll take a look at which, if any, of my current favorite folio and sleeve and back cover cases work with the new iPad as well. What are your plans for protecting the new iPad? Which cases or screen protectors will you be using? Previous PostNew iPad Specs – 1GB RAM Confirmed, Same Processor as iPad 2, MoreNext PostHow Crazy Are App Sizes Going to Get on the New iPad? I’ll be using an updated “iPad 3” leather cover from Oberon Design. The real question is, are these new cases even necessary since the body is basically the same as the iPad 2? In Oberon’s case (no pun intended) they simply tweaked the existing case to make it a bit more secure and will double check that the fit is just right on Friday when they get the new iPad in their hands. I’ve been using the Apple case with my 1st gen. iPad and been very happy with it, the iPad has been out of the case only a couple of times and is in pristine condition. I’ve ordered a smart cover for my 3rd gen. iPad and am interested in perhaps a clear back cover that could go over a gelaskins design, any ideas on one that would work? I think you’ll find a number of good clear back cover options around that will work OK with the Gelaskin, because they’re really ultra-thin. I don’t have a specific brand / model to suggest as I haven’t used one – but just make sure you call or live chat and check that one you pick definitely works with the Gelaskin. All the good manufacturers will be able to give you a straight answer right away. I already have my Best Skins Ever full body skins on order. I still have my leather Smart Cover, and I am going to order a new ZAGGfolio case to go with the keyboard I already have. I figure that will cover all the bases. So I just ordered a smart cover for the iPad. The Zaggfolio seems really awesome, but is it a bit bulky? Also, I have a bluetooth Apple keyboard I use on my iMac that I could just use for the iPad with my smart cover. Only problem is how do I carry it all? That’s where the Zaggfolio looks awesome, but now I think I’ve just wasted some cash on a smart cover. Thoughts?